One of the places we visit during our Aromas of Tuscany Tour is the holy town of Assisi on the slopes of Mt Subasio perched above the sweeping Spoletine valley. From the time of the early Umbrian tribes to the Etruscans who arrived in circa 600 BC and later the Romans who established the municipum of Asisium in 89 BC, the site that is now known as Assisi has been a place of significance. 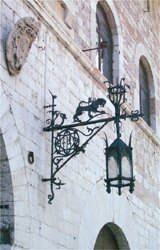 However, it was the young son of an Umbrian textile merchant named Giovanni de Bernadone who in the 13th century was to make Assisi one of the most important places in the Christian world. To begin with Giovanni enjoyed a very privileged life and planned to follow in his father's footsteps, he also had dreams of becoming a troubadour or knight. In 1201 he took part in an attack on the rival town of Perugia and in the process was taken hostage and imprisoned for one year. During this time he suffered from severe illness and as a result of this suffering the seeds of his later spiritual life were sown. 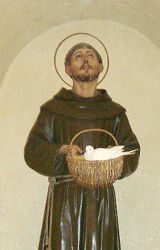 Around this time he became known by his other name of Francesco and through the generosity of the local Benedictine monks and their gift of the small chapel of St. Maria degli Angeli ( also known as The Porziuncola ), he was able to found the order of the Friars minor or Grey Friars. Francis called for simplicity of life, poverty, humility before God and working to care for the poor and diseased. Soon thousands were drawn to his message of sincerity, piety, purity and joy. The Grey Friars travelled throughout central Italy and beyond, preaching and doing there good work while Francesco turned his skills as a troubadour to the writing of prayers and hymns. In 1212 the noble woman Clara Sciffi, left her family to join Francesco at the Porziuncola where with his encouragement she founded the second Franciscan order of the Poor Ladies, later called the Clarisse's or Poor Claires. Due to the large number of people, attracted to his preaching and example, in 1221 Francesco decided to create a third, "lay" order with a set of rules of behaviour to follow. Not long after he gave up leadership of the Order and went to the mountains to live in secluded prayer. There he received the Stigmata ( the wounds of Christ ). A few followers remained with him in the mountains and from time to time he returned to visit the Franciscans, and Clara and her sisters. He died at the Porziuncula on October 3, 1226. Two years later he was proclaimed a saint. It is truly stirring to stand in the Porziuncula and reflect on the story of this amazing man.